If you’re receiving unsolicited email by Dribe claiming that if you use their service you can get more Likes and Follows on ArtStation, it is not from us. ArtStation has not been compromised. We do NOT sell your email addresses. It’s because you have your email address publicly listed. We’ve been getting many support enquiries about this from concerned artists, so it’s best if we make this information public. You’re getting emailed because you listed a public email address, not because ArtStation was compromised, and NOT because ArtStation has any association with them. 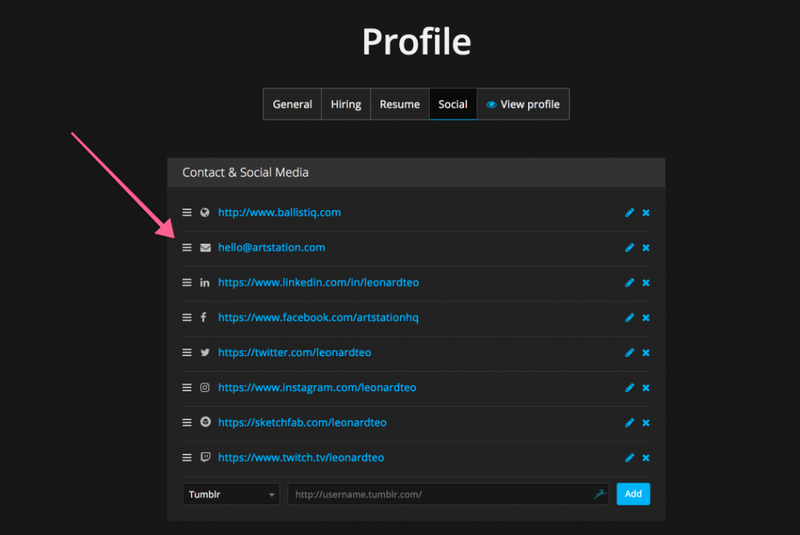 Edit your social links on your profile here. Please look carefully at the email you received. It is most definitely NOT from ArtStation. Dribe has put “Work enquiry from ArtStation” into the title and talks about ArtStation in body of the text, which makes it look like we’re somehow associated. There are several ways to protect yourself. Use a different public email address that will collect public enquiries. If you’re using Gmail, you can list your public email address in your social links using the Gmail “+” sign trick and filter these into a separate folder. Don’t show a public email address at all (see below for downsides). 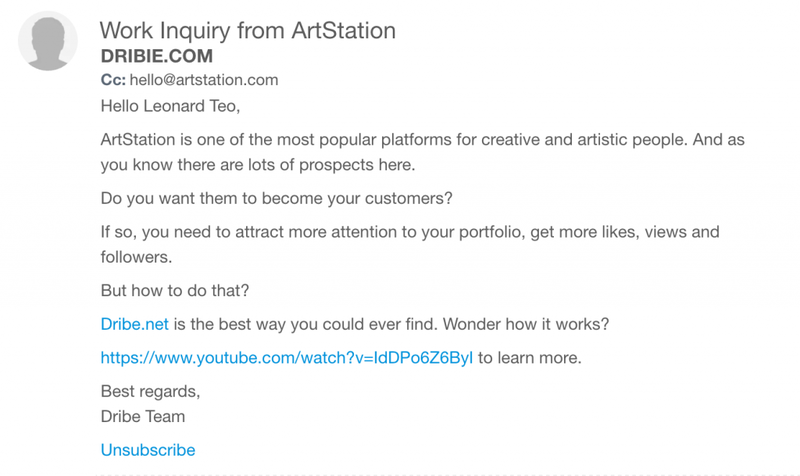 Use ArtStation’s “Hire me” functionality which doesn’t expose your email. Having worked as a freelancer for years, I recommend using a separate email address for public enquiries. As a freelancer looking for work, you want to make it as easy as possible for people to email you, but you also don’t want your main email address flooded with unsolicited emails. For example, if you have an email “fred@fredart.com”, use that for actually working with clients. Then list “info@fredart.com” as your public email address. Then configure your email client so that you can view them separately. We highly recommend using Gmail (@gmail.com free) or GSuite (paid – use your own domain). The reason is the Gmail has by far the best spam filtering out of the box. Our company emails for ArtStation all go through GSuite, and we have no problems with having our emails publicly available because we know that the vast majority of spam just doesn’t make it through. Gmail also has a “+” sign trick. For example, if you have the email address: “fredart@gmail.com”, you can set up “fredart+info@gmail.com”. Notice the “+info”. That can be anything. It can be “+foo” if you want. These are basically free variants of your email address that you can use. Create filters in your Gmail to filter these messages into a separate folder. In any case, we recommend having some kind of a separate email address that is public facing for public consumption and enquiries. You can figure out how you want to do this. Your other option is to not show a public email address at all. You can remove it in your social settings. ArtStation has a “Hire me” button that will allow people who are signed in to contact you for work – the issue here is that people do need to be signed in to use this. We do this because all our users go through a verification process to weed out potential spammers. The problem with this approach is that you might miss some important enquiries. Some studio recruiters cannot use 3rd party messaging systems to contact potential hires. They are only allowed to use email and this is in their HR hiring policies. Dribe is claiming that they can sell Likes and Follows. First of all, let’s just make it clear that using this kind of service is just lame. Secondly, on a more technical note, it’s unlikely that this would work. There are very few fake users on ArtStation because we use a really annoying verification system during sign up that requires a 2nd factor (SMS, Facebook, LinkedIn) to verify your account. The SMS uses a fraud detection backend (Telesign) that prevents people from using fake cellphone numbers from Receive-SMS-online and pre-paid mobile numbers. That’s why for a site as large as ours with an Alexa ranking of 1000 and millions of unique visitors per month, we only have such few actual, registered and verified users, because most of them are legit, verified, real users! Other sites that have less traffic than ArtStation claim to have millions of users, and most of them are bots. Only the really dedicated people who want to be on ArtStation go through this step. This is how we prevent fake users from signing up.It is very difficult to automate registration on ArtStation and the ones that do slip through are always trolls that spent the time to actually create fake Facebook accounts – those are quickly identified, banned from ArtStation, and removed on Facebook or LinkedIn after we report them. The point is, ArtStation technically has a very robust verification process on sign up that turns away many users except the really dedicated ones who want to use ArtStation. This kind of service that claims to sell Likes and Follows, is in our opinion, highly suspect. While it might work on other services, it won’t work on ArtStation. Having said that, it is very flattering to see that we’re on the same level as Behance, Dribbble, and Medium. We didn’t realize that ArtStation is regarded in the same level as these great sites. Leo is the CEO of ArtStation.